While gracefully accelerating from zero to 60-mph in a mere 4.4 seconds, the ultimate touring car utilizes Satellite Aided Transmission to incorporate GPS mapping to foresee the terrain ahead, gaining prescience of appropriate gear ratios as the vehicle proceeds. Within, voice-command telematics provide a personal valet as you languish in the sheer opulence of the Canadel Paneling ensconcing the vehicle’s yacht-like interior. The Wraith is, in short, the most powerful and dynamic Rolls-Royce ever built. Assembled within the lofty Rolls-Royce traditions of luxury, refinement and hand-craftsmanship, the new model has its own persona based upon power, style and a dramatic presence – with the slightest hint of a dark undercurrent. "Today we launch the ultimate gentlemen's gran turismo, a car that embodies the spirit of Charles Stewart Rolls," commented Torsten Muller-Otvos, CEO Rolls-Royce Motor Cars. "The most powerful Rolls-Royce in history, Wraith promises the sense of adventure and speed that drove our founding forefather. But of course, Wraith's starting point is luxury, refinement and quality, traits that remain as important to Rolls-Royce customers today as they were more than a century ago." The striking silhouette of the two-tone marvel from the world's foremost super-luxury marquee suggests the engine's oil may run blue. In profile, Wraith's sweeping fastback design gives the car its unique character. It’s sleek, seductive shape, bold lines and raked rear sweep imply the speed and grace of a Springbok. Other distinguishing aspects include a recessed grille and a wide rear track. The interior is an expanse of the softest Phantom-grade leathers and the warm ambience of Canadel Paneling, named for the French cove where Sir Henry Royce and his design and engineering teams wintered annually. All the trappings of royalty are ready to cosset four occupants in warmth and light. A glittering, starry night sky augments the Wraith’s headliner, thanks to the Bespoken Starlight Headliner, an exclusive feature available beyond the Phantom family for the first time ever. The effect is created by 1,340 fiber optic lamps, hand-woven into the lining. "The BMW Group today reconfirms its full commitment to the future of Rolls-Royce, stated Harald Kruger, Rolls-Royce Chairman and board member with the BMW Group. “Growth and a prosperous future lie ahead thanks to continued investment, careful brand stewardship and the launch of ground-breaking new models like Rolls-Royce Wraith, a magnificent addition to the product range." The 624 British horses are corralled into a V12 engine channeled through an 8-speed automatic ZF transmission, Acceleration is oh-so-smooth and effortless, and yet quite dramatic in a car this size and three tenths of a second quicker than the Ghost in zero to 60-mph trials. Producing 800 Nm of torque at 1,500 rpm on a wide rear track, shorter wheelbase and lower roof make this the most powerful, exhilarating driving experience ever in a Rolls-Royce. The suspension has been tuned to minimize body roll while cleverly amplifying feedback when cornering. The steering is weighted heavier at high speeds – less at low speeds enhancing the spirited performance. 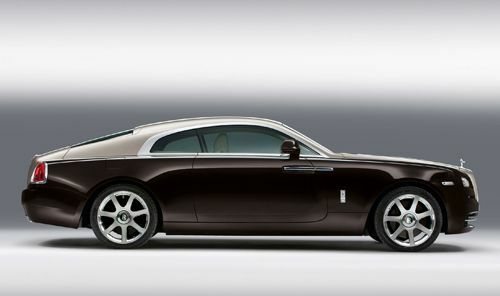 Nevertheless, the Wraith is still a Rolls-Royce rather than some colonial muscle car. Absolutely no compromise has been taken to subvert the sensation of riding on a cloud. It also has a wave in the air, thanks to the Satellite Aided Transmission technology that elevates the powertrain to a new level of seamless forward motion perfectly suiting the Rolls-Royce badge. The vehicles of Rolls-Royce have always featured technologies to support occupants discreetly, defining the unequaled driving experience the brand refers to as effortlessness. The unobtrusive systems assist the driver when needed, but fade into the background when no longer required. New high-tech advances now deliver niceties like a heads-up display, adaptive headlights and keyless ingress. Meanwhile, improvements in connectivity take the rapport between man or woman and machine to a whole new level of sophistication, nominally the telematic on-board valet. Voice activation commands enable setting a destination without inputting it on a navigation menu, beginning route guidance immediately, on-screen and via audio guidance following a command such as "navigate to Piccadilly in London." Further improvements come in the design and functionality of the elegant Spirit of Ecstasy Rotary Controller, a remarkably strange name for a touch pad or mouse. Nevertheless, it allows the control of display screen functions with a touch pad, featuring pinch and pull manipulation to echo smart phone usage. Letters can also be hand drawn onto the pad instead of scrolling through a series of characters. In Europe, the Wraith will be priced at 245,000 Euros and the first models will be delivered in the final quarter of 2013. Pricing in other markets will be announced later.